Outdoor Umbrella P506149'Aluminum, Steel FrameColor: Lemon Green.. Outdoor Umbrella P5061510'Aluminum, Steel FrameColor: Lemon Green.. Outdoor Umbrella P5061810'Aluminum, Steel FrameColor: Lemon Green.. Outdoor Umbrella P5061910'Aluminum, Steel FrameColor: Lemon Green..
With the 11' octagonal patio umbrella, a linen canopy and dark brown tiltin..
With the 9' octagonal patio umbrella, a beige canopy and dark brown tilting.. 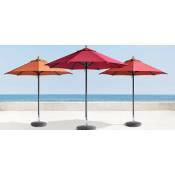 Inches: 116” W x 142.5” D x 108” HColors:CoralStyle:Contemporary..
Cover in style with this tall standing outdoor umbrella and base. It featur.. PRODUCT INFORMATIONStyle:4 seat functions: Sofa, Lounger, Chaise and Bed, W..